The fact that Jesus does his first miracle because his mother asks him in order to fulfill the joy of two spouses on the day they consecrated their love in His presence, is not casual. The story is well known. Jesus and his disciples are invited to a wedding at Cana, a small town not far away from Nazareth. We know that also Mary, the costar of the story, was there. Toward the end of the meal, the Virgin Mary was the first to notice that wine was in short supply. Politely but decidedly, she asked her Son to intervene so that the joy of the two persons that on that day had consecrated their mutual love to God could continue. It might be surprising that the Virgin was worried for something that common opinion would have considered if not superfluous at least of little importance. It would seem excessive to ask God Almighty to take care of the wine, even more, because they were almost the end of the wedding celebrations. However, the Virgin Mother is a sensible and practical woman and knows the importance of the “small” joys in life. I think that the first message of today’s gospel is: the first miracle of Jesus is a miracle of joy so that the serenity of a life under a caring Father, who has created for us sky and earth and all the things that in it, would not be coming to an end. Divine love always does miracles, even to support the small joys of the human existence, and does it with such a generosity that we might consider a waste. Christ transforms the water kept in the six stone jars into wine. To make six stone jars of wine available at the end of a meal is indeed a sign of God’s munificence. “My hour has not yet come”. Mary, who is not indifferent to what is happening the young couple, with her intercession of compassion anticipates the Hour of the Passion. Therefore, the Mother said to the servants “Do whatever he tells you”. These are the last words of Mary that are found in the gospels. Her last words and her first (the ones pronounced at the Annunciation and the ones visiting Elisabeth) are the words that Mary our Mother offers to us to show the right way to relate with Christ. I wonder if the Madonna knew that the reference to the “Hour” indicated that the nuptial event of Cana is a festive representation on whose background stands the Passion of her Son. At Cana water is transformed into wine. In Jerusalem, at the Last Supper when the Hour has arrived, wine will be “transformed” in blood. The wedding at Cana is the sign of another Covenant, the New Covenant that will be sealed by the Cross. Mary will be the Woman of the Covenant sealed by the cross. Mary, whose faith is an example for us, is guided by the Son to a more adult faith. If her request was to find a solution to the embarrassment of the young couple and of their families, the miracle done by Jesus is for a revelation at a higher level. He reveals that he has come to restore for all men and women the capacity to be a true and happy family, a holy family. He is the foundation of it, the taste and the joy, the new wine hold back to the end, and in doing so he “revealed his glory” because “the Glory of God is the living man and the life of man is the vision of God” (Saint Irenaeus) in the infinite and eternal joy. A positive answer, thanks to Mary. Saint Louis Grignon de Montford wrote,” God has united all waters and called them sea; he has united all graces and called them Mary”. The Mother of all graces could not receive a negative answer from her Son. The Virgin Mother didn’t hesitate to say to the servants “Do whatever he tells you” even before she had a positive answer. She knows that a complete faith in Him is never disappointed. She is the living Gospel, she is God’s expert. To her, the mysteries of Redemption have been revealed. Mary, humble servant freely docile to God’s Will, has listened to the divine Word. She welcomed it in her heart and under her heart and she has borne fruit. Because she was the first to listen to God and to do His will, Jesus listens to her and does her will doing an extraordinary miracle even before his hour has come. We too must listen to God, welcome him in our existence and bear fruit. We must be the evangelizers of the wonders we have seen and received. Today’s gospel is not only a wedding story. The apostle John says that on that day Jesus revealed his glory, and his disciples believed in Him. Glory indicates the deep being of a person that is revealed. Jesus begins to reveal who He really is. He is the one who gives the good wine, revealing that He is the true bridegroom everybody is waiting for, the Messiah. The wedding at Cana recalls the wedding between God and his people that had been announced by the prophets. I think that I’m not mistaken if I say that the main miracle in today’s gospel is the presence of Jesus at Cana where He purifies and sanctifies the human love between man and woman entrenching it in His Love. The miracle of the water transformed in wine is a miraculous, simple and amazing sign of a terrestrial love transformed in celestial love. The mystery (a word that means also sacrament and “place of meeting” with God) of Cana is the first of the Christian miracles and pushes us to believe completely in Jesus, as did the disciples, and at the same time gives us also total faith in Mary and encourages us to imitate Her. How can we imitate Mary? How can we have her firm faith in God? Living like Mary with the awareness that we belong to God, living a faithful life as she did. With faith and by faith Mary said “yes” to the Angel and believed that she would be the Mother of God. With and by a loving faith, Mary visited Elisabeth and praised the Almighty for all the wonders He did for the ones who have faith in Him. With and by a joyful and anxious faith the Virgin Mother gave birth to her only Son. With and by this faith she trusted Joseph and took Jesus to Egypt to save him from Herod’s persecution. With and by this faith she accepted her Son public life and accompanied Him to the Calvary remaining with Him under the Cross. With and by faith she welcomed us as her children in the Son, despite the fact that we are guilty of His death on the Cross. Let’s imitate Mary in this life of faith where prayer and action are linked together. Mary is an example of faith because she is an example of contemplation and of love made prayer. Let’s contemplate Jesus as she did. With a love that becomes prayer, let’s watch the Word become flesh when he cries, plays, works, preaches, dies on the Cross and kills death shining at Resurrection. Following the Virgin Mother’s example, let’s ask for miracles “visible” with the eyes of the body, like the one of water transformed in wine, and the Miracle “visible’ with the eyes of faith, Jesus Christ. To help us to do so, let’s look up to the consecrated Virgins whose main duty is to be contemplative springs and teachers of loving prayer for all Christians, men, and women, children and adults. It is a big duty for the Consecrated Virgins to cultivate the contemplation of Christ, living Truth, and to guide others to discover it. In this way, the primacy of contemplating overdoing and of being over having will always be recognized. The consecration of the Virgins is essentially to be and not to do. Their ministry is above all a “contemplative ministry”, a “ministry of prayer listening to the Word, and ministry of love” (Introduction to the Rite of Consecration of the Virgins, 1 and 2). In fact, the consecrated virgins in the world are a prophetic sign and testimony inside God’s people. To partake of God’s Grace they feed their life with the Body of the Groom, the meditation of the Word and regular prayer. [1.] Frequent and fierce is the devil in his attacks, on all sides besieging our salvation; we, therefore, must watch and be sober, and everywhere fortify ourselves against his assault, for if he but gain some slight vantage ground,1 he goes on to make for himself a broad passage, and by degrees introduces all his forces. If then we have any care at all for our salvation, let us not allow him to make his approaches even in trifles, that thus we may check him beforehand in important matters; for it would be the extreme of folly, if, while he displays such eagerness to destroy our souls, we should not bring even an equal amount in defense of our own salvation. I say not this without a cause, but because I fear lest that wolf be even now standing unseen by us in the midst of the fold,2 and some sheep become a prey to him, being led astray from the flock and from hearkening by its own carelessness and his craft. Were the wounds3 sensible, or did the body receive the blows, there would be no difficulty in discerning his plots; but since the soul is invisible, and since that it is which receives the wounds, we need great watchfulness that each may prove himself; for none knoweth the things of a man as the spirit of a man that is in him. (1Co 2,11). The word is spoken indeed to all and is offered as a general remedy to those who need it, but it is the business of every individual hearer to take what is suited to his complaint. I know not who are sick, I know not who are well. And therefore I use every sort of argument and introduce remedies suited to all maladies,4 at one time condemning covetousness, after that touching on luxury, and again on impurity, then composing something in praise of an exhortation to charity, and each of the other virtues in their turn. For I fear lest when my arguments are employed on any one subject, I may without knowing it be treating you for one disease while you are ill of others. So that if this congregation were but one person, I should not have judged it so absolutely necessary to make my discourse varied; but since in such a multitude there are probably also many maladies, I not unreasonably diversify my teaching, since my discourse will be sure to attain its object when it is made to embrace you all. For this cause also Scripture is something multiform,5 and speaks on ten thousand matters, because it addresses itself to the nature of mankind in common, and in such a multitude all the passions of the soul must needs be; though all be not in each. Let us then cleanse ourselves of these, and so listen to the divine oracles, and with contrite heart6 hear what has been this day read to us. And what is that? “This beginning of miracles did Jesus in Cana of Galilee,” I told you the other day, that there are some who say that this is not the beginning. 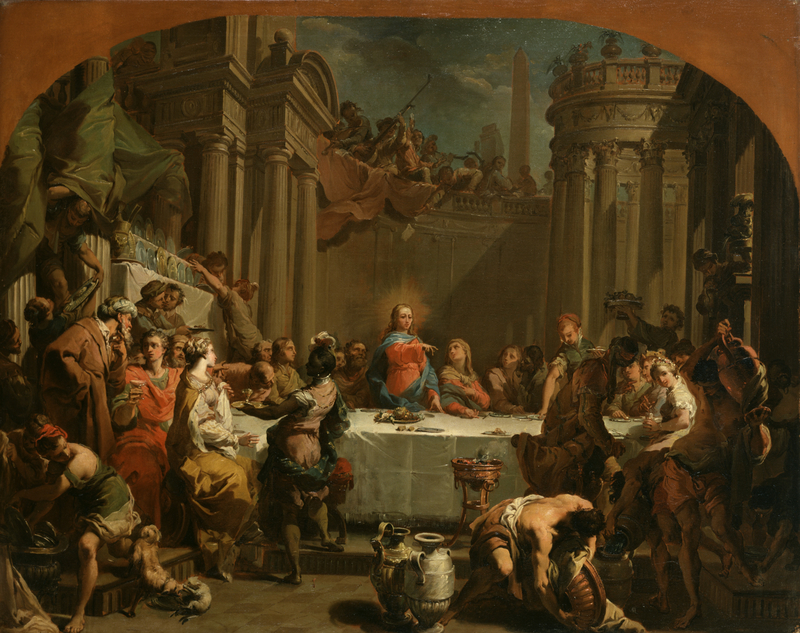 “For what,” says one, “if ‘Cana of Galilee’ be added? This shows that this was ‘the beginning’ He made ‘in Cana.’”7 But on these points I would not venture to assert anything exactly. I before have shown that He began His miracles after His Baptism, and wrought no miracle before it; but whether of the miracles done after His Baptism, this or some other was the first, it seems to me unnecessary to assert positively. His disciples, who even before this regarded Him with wonder.8 Seest thou that it was especially necessary to work the miracles at times when men were present of honest minds, and who would carefully give heed to what was done? for these would more readily believe, and attend more exactly to the circumstances. “And how could He have become known without miracles?” Because His doctrine and prophetic powers were sufficient to cause wonder in the souls of His hearers, so that they took heed to what He did with a right disposition, their minds being already well affected towards Him. And therefore in many other places, the Evangelists say, that He did no miracle on account of the perversity of the men who dwelt there. (Mt 12,38 ch. 13,58, &c). (He received baptism then a few days before the Passover. But on going up to Jerusalem, what did He added full of high authority; for He cast out of the Temple those dealers and money changers, and those who sold doves, and oxen, and sheep, and who passed their time there for this purpose. They do not in this contradict each other but show that he did this a second time, and that both these expressions were not used on the same occasion, but that He acted thus once at the beginning of His ministry, and again when He had come to the very time of His Passion. Therefore, (on the latter occasion,) employing more strong expressions, He spoke of it as 11 (being made) “a den of thieves,” but here at the commencement of His miracles He does not so, but uses a more gentle rebuke; from which it is probable that this took place 12 a second time. “And wherefore,” says one, “did Christ do this same, and use such severity against these men, a thing which He is nowhere else seen to do, even when insulted and reviled, and called by them ‘Samaritan’ and ‘demoniac’? for He was not even satisfied with words only, but took a scourge, and so cast them out.” Yes, but it was when others were receiving benefit, that the Jews accused and raged against Him; when it was probable that they would have been made savage by His rebukes, they showed no such disposition towards Him, for they neither accused nor reviled Him. What say they? Seest thou their excessive malice, and how the benefits done to others incensed them more (than reproofs)? At one time then He said, that the Temple was made by them “a den of thieves,” showing that what they sold was gotten by theft, and rapine, and covetousness, and that they were rich through other men’s calamities; at another, “a house of merchandise,” pointing to their shameless traffickings. “But wherefore did He this?” Since he was about to heal on the Sabbath day, and to do many such things which were thought by them transgressions of the Law in order that He might not seem to do this as though He had come to be some rival God 13 and opponent of His Father, He takes occasion hence to correct any such suspicion of theirs. One who had exhibited so much zeal for the House was not likely to oppose Him who was Lord of the House, and who was worshiped in it. No doubt even the former years during which He lived according to the Law, were sufficient to show His reverence for the Legislator, and that He came not to give contrary laws; yet since it was likely that those years were forgotten through lapse of time, as not having been known to all because He was brought up in a poor and mean dwelling, He afterwards does this in the presence of all, (for many were present because the feast was nigh at hand,) and at great risk. For he did not merely “cast them out,” but also “overturned the tables,” and “poured out the money,” giving them by this to understand, that He who threw Himself into danger for the good order of the House could never despise his Master. Had He acted as He did from hypocrisy, He should only have advised them, but to place Himself in danger was very daring. For it was no light thing to offer Himself to the anger of so many market-folk, 14 to excite against Himself a most brutal mob of petty dealers by His reproaches and His blows, this was not the action of a pretender, but of one choosing to suffer everything for the order of the House. And therefore not by His actions only, but by His words, He shows his agreement with the Father; 15 for He saith not “the Holy House,” but “My Father’s House.” See, He even calls Him, “Father,” and they are not wroth; they thought He spoke in a general way: 16 but when He went on and spoke more plainly, so as to set before them the idea of His Equality, then they become angry. But the Jews did not remember the Prophecy, and said, “What sign showest Thou unto us?” (Ps 69,9), both grieving that their shameful traffic was cut off, and expecting by these means to stop Him, and also desiring to challenge Him to a miracle and to find fault with what He was doing. Wherefore He will not give them a sign; and before, when they came and asked Him, He made them the same answer, “A wicked and adulterous generation seeketh after a sign; and there shall no sign be given unto it, but the sign of the prophet Jonas.” (Mt 16,4). Only then the answer was clear, now it is more ambiguous. This He doth on account of their extreme insensibility; for He who prevented 18 them without their asking, and gave them signs, would never when they asked have turned away from them, had He not seen that their minds were wicked and false, and their intention treacherous. 19 Think how full of wickedness the question itself was at the outset. When they ought to have applauded Him for His earnestness and zeal when they ought to have been astonished that He cared so greatly for the House, they reproach Him, saying, that it was lawful to traffic, and unlawful for any to stop their traffic, except he should show them a sign. What saith Christ? “Forty and six years,” they said, referring to the latter building, for the former was finished in twenty years’ time. (Esd 6,15). 2303 [3.] Wherefore then did He not resolve the difficulty and say, “I speak not of that Temple, but of My flesh”? Why does the Evangelist, writing the Gospel at a later period, interpret the saying and Jesus keep silence at the time? Why did He so keep silence? Because they would not have received His word; for if not even the disciples were able to understand the saying, much less were the multitudes. “When,” saith the Evangelist, “He was risen from the dead, then they remembered, and believed the Scripture and His word.” There were two things that hindered 20 them for the time, one the fact of the Resurrection, the other, the greater question whether He was God 21 that dwelt within; of both which things He spake darkly when He said, “Destroy this Temple, and I will rear it up in three days.” And this St. Paul declares to be no small proof of His Godhead, when he writes, “Declared to be the Son of God with power, according to the Spirit of holiness, by the Resurrection from the dead.” (Rm 1,4). But why doth He both there, and here, and everywhere, give this for a sign, at one time saying, 22 “When ye have lifted up the Son of Man, then ye shall know that I Am” (Jn 8,28); at another, “There shall no sign be given you 23 but the sign of the prophet Jonas” (Mt 12,39); and again in this place, “In three days I will raise it up”? Because what especially showed that He was not a mere man, was His being able to set up a trophy of victory over death, and so quickly to abolish His long enduring tyranny, and conclude that difficult war. Wherefore He saith, “Then ye shall know.” “Then.” When? When after My Resurrection I shall draw (all) the world to Me, then ye shall know that I did these things as God, and Very Son of God, avenging the insult offered to My Father. “Why then, instead of saying, ‘What need is there of “signs” to check evil deeds?’ did He promise that He would give them a sign?” Because by so doing He would have the more exasperated them; but in this way, He rather astonished them. Still, they made no answer to this, for He seemed to them to say what was incredible so that they did not stay even to question Him upon it, but passed it by as impossible. Yet had they been wise, though it seemed to them at the time incredible, still when He wrought His many miracles they would then have come and questioned Him, would then have intreated that the difficulty might be resolved to them; but because they were foolish, they gave no heed at all to part of what was said, and part they heard with evil frame of mind. And therefore Christ spoke to them in an enigmatical way. The question still remains, “How was it that the disciples did not know that He must rise from the dead?” It was because they had not been vouchsafed the gift of the Spirit; and therefore, though they constantly heard His discourses concerning the Resurrection, they understood them not, but reasoned with themselves what this might be. For very strange and paradoxical was the assertion that one could raise himself, and would raise himself in such wise. And so Peter was rebuked, when, knowing nothing about the Resurrection, he said, “Be it far from Thee.” (Mt 16,22). And Christ did not reveal it clearly to them before the event, that they might not be offended at the very outset, being led to distrust His words on account of the great improbability of the thing, and because they did not yet clearly know Him, who He was. For no one could help believing what was proclaimed aloud by facts, while some would probably disbelieve what was told to them in words. Therefore He at first allowed the meaning of His words to be concealed; but when by their experience He had verified His sayings, He after that gave them understanding of His words, and such gifts of the Spirit that they received them all at once. “He,” saith Jesus, “shall bring all things to your remembrance.” (Jn 14,26). For they who in a single night cast off all respect for Him, and fled from and denied that they even knew Him, would scarcely have remembered what He had done and said during the whole time unless they had enjoyed much grace of the Spirit. “But,” says one, “if they were to hear from the Spirit, why needed they to accompany Christ when they would not retain His words?” Because the Spirit taught them not, but called to their mind what Christ had said before; and it contributes not a little to the glory of Christ, that they were referred to the remembrance of the words He had spoken to them. At the first then it was of the gift of God that the grace of the Spirit lighted upon them so largely and abundantly; but after that, it was of their own virtue that they retained the Gift. For they displayed a shining life, and much wisdom, and great labors, and despised this present life, and thought nothing of earthly things, but were above them all; and like a sort of light-winged eagle, soaring high by their works; reached 24 to heaven itself, and by these possessed the unspeakable grace of the Spirit. Let us then imitate them, and not quench our lamps, but keep them bright by alms-doing, for so is the light of this fire preserved. Let us collect the oil into our vessels whilst we are here, for we cannot buy it when we have departed to that other place, nor can we procure it elsewhere, save only at the hands of the poor. Let us, therefore, collect it thence very abundantly, if, at least, we desire to enter in with the Bridegroom. But if we do not this, we must remain without the bridechamber, for it is impossible, it is impossible, though we perform ten thousand other good deeds, to enter the portals of the Kingdom without alms-doing. Let us then show forth this very abundantly, that we may enjoy those ineffable blessings; which may it come to pass that we all attain, by the grace and lovingkindness of our Lord Jesus Christ, with whom to the Father and the Holy Ghost be glory, forever and ever. Amen. 2 or “sacred enclosure,” shkw`. 4 Morel. and ms. in Bodl. read the passage thus: kinw`, pa`sin ajnqrwvpoi” oJmoivw” ajrmovzonta, kai; pa`sin ejpithvdeion pavqesin). 6 Morel. and ms. in Bodleian read: ou(tw toi`” qeivoi” lovgoi” prosbavllwmen, kai; ou(tw meta; suntetrimmevnh” sfovdra th`” dianoiva” k.t.l..
7 Morel. and ms. in Bodleian read: ti; ga;r a]topon proskei`sqai ejn Kana`/, kai; mh; ajrch;n ei\nai tauvthn tw`n tou` AEIhsou` shmeivwn. 8 [admired and believed] Morel. and ms.
10 Lc 19,46, uJmei`” ejpoihvsate k.t.l.. G. T.
14 or, “base persons,” ajgoraivwn. 15 th;n pro;” aujto;n sumfwnivan. 21 Savile, JO Qeo;”, “whether He was the One God”; but the article is not found in Ben. Morel. or mss. 23 aujth`/ [genea`/] G. T).